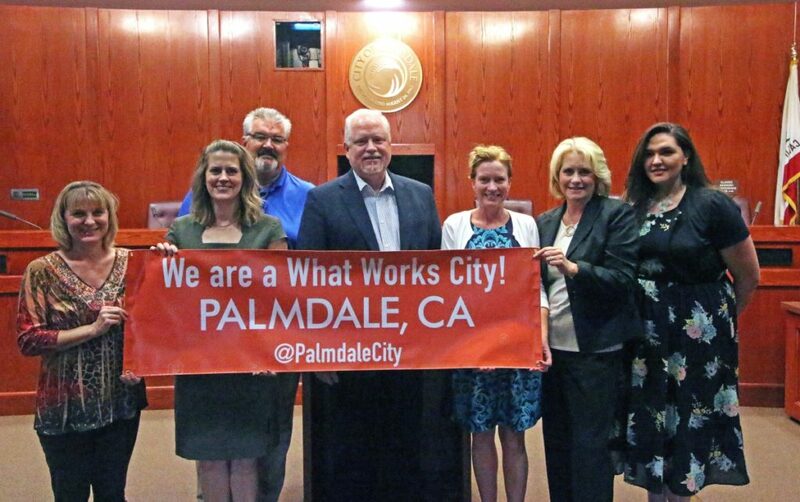 PALMDALE – Palmdale has been selected as one of five new cities to participate in Bloomberg Philanthropies’ national What Works Cities initiative — one of the largest philanthropic efforts to enhance the use of data and evidence in the public sector. Palmdale will receive technical assistance from world-class experts to build its capacity to address local issues using data and evidence. Palmdale will improve open data practices in order to make municipal data more accessible and engage residents around government priorities and services, with initial work focusing on recreation and quality of life initiatives. Palmdale’s selection, along with that of Athens, GA; Chula Vista, CA; Gainesville, FL; and Colorado Springs, CO, was announced this week by What Works Cities and Results for America, one of the initiative’s five partner organizations. What Works Cities is now partnering with 95 cities across the country that are home to more than 29 million people in 37 states and have annual budgets exceeding $98 billion. The initiative will partner with 100 cities on a rolling basis through 2018. With support from a consortium of expert partners, What Works cities are identifying more effective ways to evaluate programs and improve performance; best use resources to serve their communities; and address a range of social challenges – from public safety to affordable housing. What Works Cities participants also join the initiative’s extensive learning network of local leaders and global experts actively sharing best practices for outcomes-focused government. Through this partnership, Palmdale will invest in its data management and open data practices to help increase the quality of life in the city, enable progress towards its recreation and culture goals, and connect with the community in the process. The consortium of expert organizations assembled by Bloomberg Philanthropies to deliver support to cities comprises the Behavioral Insights Team, the Center for Government Excellence at Johns Hopkins University, the Government Performance Lab at the Harvard Kennedy School, Results for America and the Sunlight Foundation. 2 comments for "Palmdale selected to join national ‘What Works Cities’ initiative"
Hysterical laughter because I can’t help thinking about what would happen if Lancaster got into a program that improved open data practices. Just the thought that light might shine on Lancaster’s records would give Wrecks and his crew an adrenaline rush that would probably blow their eyes right out of the sockets. If there is an aspiring journalist out there who wants to break a story, Lancaster is ripe for the picking. The cesspool at Fern Street when revealed will be Bell-esque.